Assessment swim done: Let the training...continue! To make a long story short, my 6-hour qualifying swim is done and the paperwork is now finished - save for my physical. Let me catch you up. 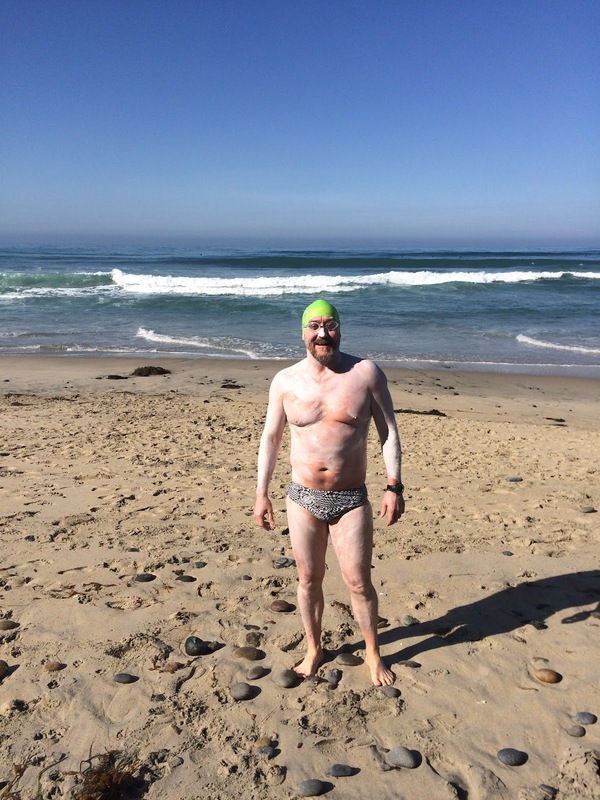 Last Thursday evening, I flew out to San Diego to complete the required 6-hour cold water "assessment" swim. My friends Tasha and Anders live out there and they were kind enough to host me. Also, my good pal from VA - Chris - is a graduate student at UCSD. Both Anders and Chris are outstanding swimmers and offered to lend a hand for the swim. I briefly contacted them a few months ago and said I would be out in late February to enjoy the upper 50 degree F water of the Pacific Ocean. They were encouraged but not mandated to join me. I know these guys well. Just the invitation would be enough to lure them in the water. Now, they may not be dressed like me or rather they may not be as undressed as me but they would join me for parts of the swim. I knew I could count on their company. 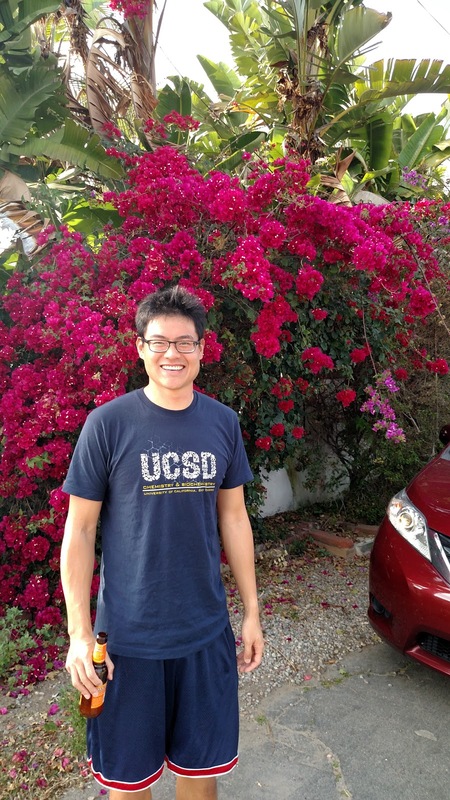 Chris Lee - lean, mean, eating, swimming, cycling, researching machine. We headed immediately over to Tasha and Anders' house to see their kids (twin 11-year old fun-loving boys) and the parents of course. Our aim: finish the "snacks" with them. I was beat and so were my hosts but we managed to stay up until 1am (4am my time and my usual wake-up time at home) drinking a few beers, eating burritos, and laughing about all sorts of things. We hit the rack shortly after 1am because Friday was going to be my shake-down swim. I wanted to look and feel my best and what better way than to deprive myself of sleep, drink a bunch of (great) beer, and eat 5,000 kcal of food. Yep, I was ready. Friday came way too early. It was a struggle to sleep but my brain kept yelling at me to go back to sleep. There would be no sleep because Anders and I had to get out for our swim before we had evening party plans. You see, Tasha and Anders are wonderful hosts. They organized a bunch of social events, included me in all of them, and even had Chris and his wonderful girlfriend Bryn come along. Bryn was busy with graduate student activities but she joined us from time to time. Mostly, it was a social weekend with Tasha, Anders, Chris, the boys, and me. Anders and I swam from La Jolla Shores (sorry Graham, didn't know you lived there but will be back in July to tip back a few pints and talk about the old days) out into La Jolla cove. It was a spectacular day by any standards. I donned my old transparent suit that has tons of holes and barely covers me, slathered my body in Desitin, and headed out with Anders (fully clad in a wetsuit) for an hour or two swim. I felt great. It was like being home. The "cove" is one of the most magnificent places on earth. Sea life surrounds us as we swim in somewhat protected waters. Typically, there are many swimmers out but the surf and winds were a little strong so Anders and I found ourselves alone for the entire outing. We logged about an hour or so and decided to head back in because I got what I wanted out of the shake-down swim and figured I would save my energy for when it counted - Saturday. 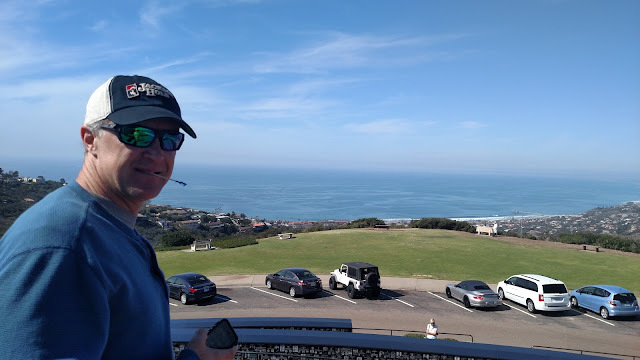 Afterwards, we hit a deli for some outstanding grub, headed up to this high point in San Diego while I tipped back a few malt pops and scarfed down the lamb sandwich recommended by the deli owner. It was a grand afternoon and the fun was only beginning. Anders - the real hero in this story - atop San Diego where we dined to our hearts' content. Anders and I headed back to his place, took rather lengthy naps, and readied ourselves for more festivities. Unfortunately, my body had enough. I managed to go out for about an hour but raised the proverbial white flag - surrendering without much fight. Chris and I talked science while kids and adults stood feet away from us. The din inside was too much to bear and I couldn't hear Chris at all. So, it was time to head out. Tomorrow was a big day! Saturday came quickly and I was really excited to get out into the water. The previous evening, Anders and I were chatting about where to do the swim. I figured the best place would be the "cove" but Anders rightly figured that Solana Beach would be more convenient because they have a condo on the water (but live in Del Mar). The condo afforded us some amenities that would not be around for us in either the "cove" or La Jolla Shores. So, in the morning, despite HUGE waves in the forecast, we opted for Solana Beach. It was a great move in retrospect because we had access to a hot tub, pool, beer, and food afterwards and my support crew could easily manage the feeds and keep an eye out for me. Anders did mention the previous night that Solana Beach was home to a recent great white shark attack - a little know fact I could have done without but it was fine. I was ready to fight that shark to the bitter end. Looking rather whale-like and ready for a 6-hour swim in...er pretty cold water. Here we go! The surf was pretty big by the time we got to the beach but I managed to get outside the break without drinking too much salty sea water. A half of pint managed to sneak into my stomach with one large gulp. If it were not for my 4 egg breakfast, 5 pieces of toast, pop-tarts, and 5 cups of tea, I wouldn't have had anything to expel. Boy was I lucky. Lost a few eggs but no matter, I had more stowed away deeper in the recesses of my digestive system. I swam for the first hour unaccompanied but loving life. A seal poked up right next to me and (s)he gave me quite a start. I had no clue who was around or what was around. Thankfully, I had my pal to attract great white sharks AND outswim me. Hey, wait a second! I had to extinguish that thought from my head. Sharks were no doubt lurking about but what would they want with a rotund, pasty white human? I was hoping not much. That hour went by so quickly. I was ready for a snack but not a Chris snack, a marathon swimmer snack would do quite nicely. Anders managed to paddle out through that ever-building surf and handed me my food. If you have a vivid imagination, you can call a blue rubbermaid flip-top bottle of white, milky substance food. I do, so join me in my delusional world. The UCAN Superstarch actually tasted great because it helped me off-set the briny taste that settled into my mouth over that first hour. I drank down about 200 calories and headed back into the great unknown, staying parallel to the shore for the entire time. It was a glorious swim day. Chris met us just as I finished that first feed. He chose to wear a "shorty" wetsuit and soon regretted that decision. The water was cold - even for my whale-like physique. Chris immediately got cold but hung in there for about a 45 minute swim with me. We had a blast swimming together. Chris is a monster swimmer. He blows me away in the pool. In fact, I believe his breaststroke is faster than my freestyle. For the days leading up to the swim, I kept telling Chris and Anders that the swims in open water were relaxing, non-competitive swims where we all adjusted our pace to stay together. Thankfully, Chris' directions were a bit off so he managed to swim about 3x my distance as he zig-zagged his way up the coast with me. We called it "tacking" from our days sailing together. It was great fun. Chris was a trooper staying out there for 45 minutes but the time came where he needed to warm up. So off he went to see if Bryn was up for his kind of snacks. I kept going but was soon greeted by Anders with another feed. The feeds require a little more detail just so you get a clear picture of Anders' herculean efforts throughout the day. According to surfline, the waves were 11 footers where we were swimming and they were every bit as large if not larger than that number. Anders and I agreed that I would feed every 30 minutes. The blue bottle contained my fuel (Superstarch, CarboPro, and sometimes a mix of the two), the green bottle had fresh water, and the red bottle held watered-down mouthwash. Well, the surf gods deemed mouthwash totally inappropriate for this swim. Gone was the red bottle after his first push out. Each paddle out, Anders had to deal with these huge crashing waves while he pulled out my bottles while managing his huge stand-up paddle board. I couldn't believe he was getting through that surf but he was hell-bent for leather to keep me on my feed schedule. Anders was the real endurance king that day. I just swam. He swam probably the same distance I swam but his distance was always against HUGE waves. Each trip in and out got more perilous than the previous ones. I was incredibly grateful that he was the brave soul who "volunteered" to help. After a while, Anders could only manage to bring out the feed bottle because the others got washed away, ripped off the cordage holding them together, or breaking free from the carabiners that held them on his belt. Needless to say, I got through the swim because Anders got through the surf. By this time, I was almost 4 hours into my 6-hour swim and felt great. The little bit of cold I felt during the first hour went away completely and gave way to this wonderful, comfortable feeling of swimming in the most heavenly place. During my alone time between 3 and 4 hours, I was approached by two dolphins who surfaced about 20 feet from me. I just stared in wonder and felt very grateful for the chance to share their ocean. Chris joined me for the last two hours in a full wetsuit. He learned from his first outing that the cold water didn't agree with is new lean, mean body. Chris also managed to stay more on a straight course while Anders paddled alongside us. We swam up a mile or so, turned around, did that "lap" a few times and all of a sudden, it was nearing the 6 hour mark. I was ready to get out, enjoy a real meal, and drink a nice cold beer. The thought occurred to me that I was a little tired but felt good. What also occurred to me was that the surf was still rather large but nothing compared to those 11 foot monsters that Anders laid to waste. Chris, Anders, and I talked about our strategy to avoid the reefs and head toward sandy shores. We chose wisely because the pounding surf and sand was all I could handle as I got closer to shore. Standing on the beach after those hours in a horizontal position felt weird but peaceful. As Chris and I got out, we were greeted by some of the local lifeguards. They were keeping an eye on me as I swam back and forth throughout the day. I enjoyed chatting with them but really wanted to get out of the sun. That beer was calling my name. So, off we headed to the shower and hot tub. First, the shower where, with the help of baby oil, I removed the Desitin. Then, burrito in the hot tub. What better way to end a long swim that hang out with great friends, eat SoCal burritos, and drink down a few frosty cold ones. The swim was over. I was ready to relax and relax I did. Still slathered in Desitin but hankering for that first cold beer. It was a great day in the company of great friends. I managed probably 11-13 miles in really rocking waves and big surf inside. Glad I could share the experience with Anders and Chris. They were the real adventurers. I had been training in the pool by swimming 20-25 miles a week; those two were cycling, running, and doing land sports. Yep, they rocked it and deserve the credit. I swam. I felt great, refocused after perseverating on sharks for a moment, and built a ton of confidence going forward in my training. Thanks for following. I have more to discuss from that trip and a few new details on my climb in May. Stay tuned for those details in a day or so. I celebrate the time I had with him and will forever pay forward the kindness he showed me throughout our time together. 2. Working. Yes, I work as well as play. Over the past few months, I dedicated myself to a few projects that are now finally starting to pay off and produce more interesting results. Many of you know that I am a professor and I love my job, students, and lifestyle. What you may not know is what exactly do I study. Well, here are a few things I am starting to work on that may prove to be quite ambitious but hopefully fruitful. Rapid prototyping of measures: My students and I - along with my great friend and colleague Todd Kashdan - started developing several measures in a way that few if any have used before. We brainstorm ideas, construct questions (or items), conduct cognitive think aloud sessions to refine the questions, and then (and here is the novel part), we deploy them on the web using Amazon's Mechanical Turk, Reddit, Facebook, or any other outlet that helps us collect data rapidly. Once we get our initial data, we analyze the data to see if it provides us with what we expected or, better yet, something novel. The latter is the most exciting. After the initial data collection, we revise the instrument, go thought the entire process again, and keep doing so until we refine what we want and what we collect. Pretty cool, eh? This process would not be possible without the help of many people across many different disciplines. 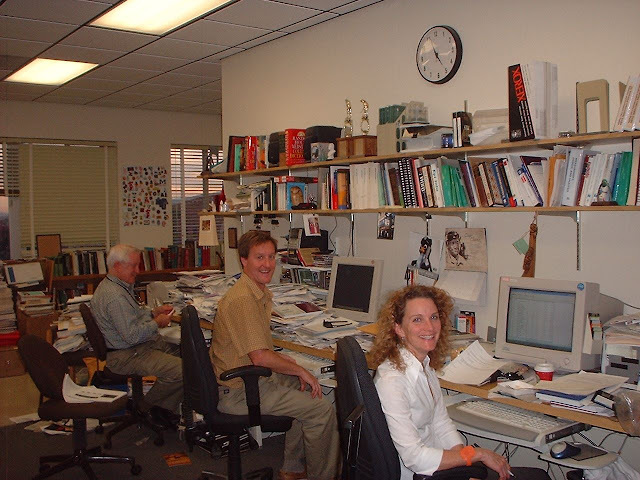 Thanks to a great team, we have a few measures about to hit the academic journals and, perhaps even more important, to the public as useful instruments to gain insights where they may have been difficult to gain before. Naturalistic observations and the processes of behavioral change: We all want to know what works for us when it comes to behavior. Think about the behaviors you wish to change - eating habits, exercise, time management, and the like comprise most of our new year's resolutions. Despite our will to change, we rarely do or at least those changes decay quickly over time. I am interested in observing behaviors in places where behaviors matter the most. Observation is not really my goal. I want to learn how to observe these behaviors unobtrusively and learn what helps us change them the quickest way with the least amount of effort AND maintain those changes. So, where are the place I refer to above? Well, the kitchen, bedroom, bathroom, office, and other "personal places" come to mind as the locations where behaviors matter the most. Do you eat well, sleep 8 hours a night, brush/floss, wash your hands, focus on work when working, and remain reasonably active throughout your day? If I asked you those questions, you would often say yes - especially if I asked you around others who watched you respond. That type of response is what social scientists refer to as reactive responding. I want to know and employ unobtrusive measures whereby the observation takes place without the person knowing they are being observed. This observational process is not like "Big Brother" from Orwell's 1984 but rather a personalized approach to each person monitoring his/her behavior. In our lab, we are setting up remote sensors to help people monitor their behavior and for us to observe these behaviors in more public places where they may be more indicative of health, social, and occupational functioning. Tons of work with STATS.org: As you all know by following my blog, I am interested in statistics, data visualization, and science. I found a great home with kindred spirits in my own lab and with the folks at STATS.org - housed in my own university. We review and comment on science reporting to help journalists accurately and fairly evaluate scientific contributions. The journalists are wonderful because they are open to new ideas and readily learn the nuances of scientific reporting. I learned a fair bit in the short time working with the group and look forward to more work in the near future. Some of the pieces we worked on recently involved toxicology reports about BPA and various other projects kept all of the STATS.org folks busy for the past few months. I have a few other posts coming that focus on "hot" topics you might find compelling including the treatment of chronic fatigue syndrome (specifically the PACE trial), the evidence about artificial sweeteners in humans, and the effects of salt on our health and well-being. Please browse the STATS.org site and send us comments or suggestions should they arise. ADVENTURE 1: Denali. I mentioned in previous posts that I planned to help out my friend Dave Williams on his quest to climb the 7 Summits by running from the sea to the base and then climbing the mountains. Dave just successfully climbed Aconcagua after 2 previous failed summit bids. He dedication to his cause is remarkable and admirable. To show my respect, I volunteered to help him climb Denali this May. I love his attitude. He is a trooper and the climb should be fun. Right now, we are finalizing plans. I will post more details about the climb but for now, I will say that this is quite an adventure. Dave had to coordinate the run from the sea to the Kahiltna glacier and that is just the warm-up! After that approach, he will climb with me and several others. Right now, we are bracing for some odd weather given the huge El Nino effects that seem to be affecting all parts of the Pacific Northwest - including Alaska. ADVENTURE 2: Catalina Channel and English Channel week. Yep, I plan to do them one week apart. 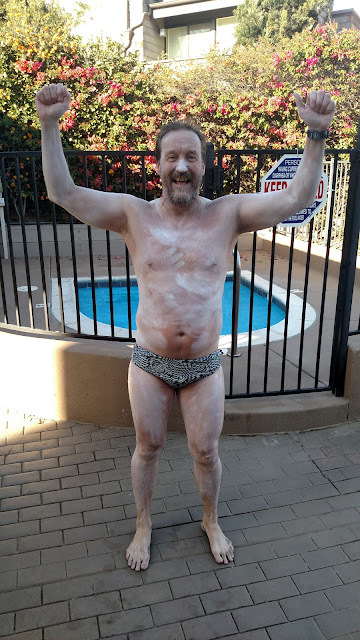 I turn 50 on July 5th and there is no better way than to spend it swimming for the next few weeks. Right? My Catalina Channel swim begins on midnight July 11th, 2016 and my English Channel swim begins one week later (weather permitting). Right now, I am in San Diego where I just completed my 6-hour qualifying swim in the Pacific Ocean - just off the shore of Solana Beach (more on that swim in my next update). Now that I am done with that step, I can submit my final documents for both swims. I am committed and ready after yesterday's awesome adventure. ADVENTURE 3: Mountain Ride 2016. My family and friends plan to ride our bikes form Salt Lake City to Denver (500-600 miles with 25,000 feet of climbing and 24,000 feet of descending) sometime in August. I think we will do the ride over 8-10 days so only one week of vacation is necessary for those who actually work during the summer. If any of you want to join us, feel free to do so. Expect more details in the upcoming posts. More updates to follow with pictures and such. Sorry for the long silence. Note: sent from my handheld distraction device.